All too often I hear people dismiss networking as a ‘necessary evil’ that’s nevertheless an important part of their company’s business development strategy. I may wholeheartedly disagree with the term ‘evil’ but it’s always good to hear networking being referred to as ‘necessary’. You will hear a lot of the word “networking” in our executive career coaching & outplacement services. With technology accelerating change in the business environment we all operate in, and the concept of a job or even career ‘for life’ becoming a distant memory, networking has never been more important -not just for business development- but also for individual career development and progression. Additionally, the rise and popularisation of ‘portfolio careers’ which sees people holding a mix of positions concurrently or transferring their expertise between sectors, reinforces the need to make networking a priority. How does networking fit in? As you move from position to position and maybe between sectors, your personal brand– your contacts, relationships, knowledge and opinions- are what you take with you. Two important points to consider here are: today, many of the jobs available are never advertised, something commonly referred to as the hidden jobs market; and that people hire people that they like. Networking addresses both of these -it’s how the business community you operate in (both in real life and via social media)- get to know, like and trust you over time. A vacancy costs organisations time and money. The work that has to be covered falls to the existing workforce and traditional methods of recruitment via agencies, and advertising is expensive and doesn’t always bear fruit. More companies are now looking internally or within their network of contacts to find candidates that they can quietly approach. It makes perfect sense to try and find someone that they already have a relationship with and, more importantly, someone they know will fit into their culture and existing team. The vast majority of people only turn to networking when they’ve lost their job. This means that they approach networking from a position of relative weakness. A better tactic is to make networking a part of your everyday working life so that you have a vibrant network of contacts to fall back on should you need it. As well as the Buddhist ‘digging a well’ saying, I like to use the analogy of an allotment. Your network needs to be seeded, weeded and watered regularly. Do this and it will provide you with a harvest of opportunities throughout your life. Likeability is a key attribute that will determine most of your experience of life. Your ability to find your dream job is no exception. After all, effective networking begins not with what you can get out of an event, group or individual contact, but what you can do for other people. So spend your time thinking about likeability -how can you be helpful? How can you become the ‘go to’ person in your particular niche? In order to get the most out of your networking, it’s vital to do your research and invest time in yourself. Determine which area you want to work in, defining parameters by sector and location. Dare to dream -what companies would you like to work for or with? Search your LinkedIn contacts for people who are connected to the company or individuals in question and ask for an introduction. Follow them on Twitter and when they follow back start a conversation. Some of my most valuable contacts have come via Twitter (find out how senior executives are tweeting their way to job search success). To build a relationship with a company or individual to the point where they hire or do some business with you takes time, on average around 18 months from the first contact. It’s important to build relationships with as many people as possible within your target organisations. You want the power of ‘word of mouth’ working for you. Never forget the power of a ‘thank you’. Many people do, so acknowledgement with a simple thanks reinforces your mastery of networking to your new employer or contact. 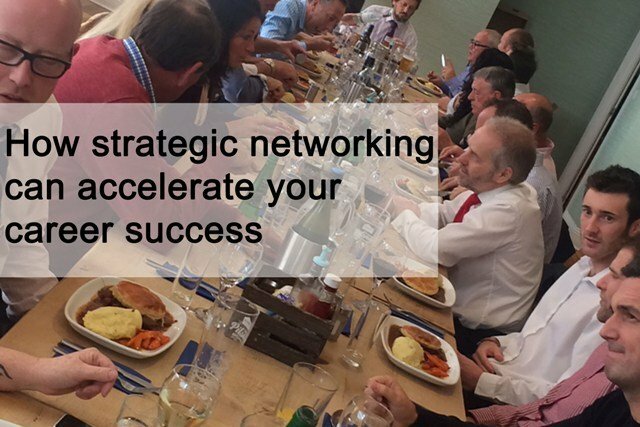 And as we all know networking is an important part of any business growth strategy. So if you’d like to take your own self-marketing to the next level, drop us a line to arrange a chat.